A number of surveys and polls indicate that more than half of all Russians are nostalgic about the Soviet era — even those who were not born then. Sociologists say the attitudes are a reflection of today’s economic challenges and mythologization of the USSR in pop culture. When the Soviet republics of Russia, Ukraine and Belarus signed the Belavezha Accords on December 8, 1991, dissolving the Soviet Union, Marat was just a few months old. He did not know life in the Soviet Union. Nevertheless, he says he misses that country. Marat, whose real name is being withheld at his request, is now 25 years old. He works in one of the Russian ministries, is satisfied with his salary and life, but still believes that things must have been better in the USSR. "Free education, free medicine," Marat said, listing the advantages of the Soviet state. “People lived modestly but the state took care of them. Now money controls everything. The inequality is immense. Whoever is stronger is right. It wasn't like this in the USSR." Marat is not alone in his nostalgia. 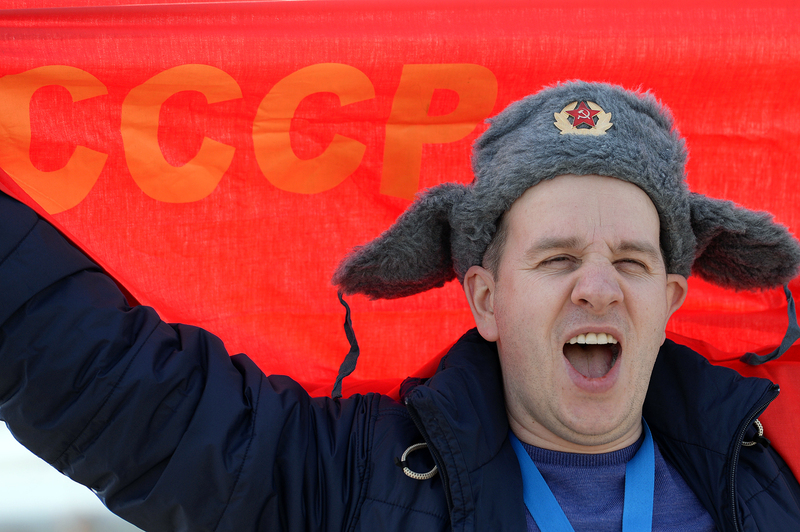 Sociological surveys indicate that more than 50 percent of Russians today regret the collapse of the Soviet Union. In an April 2016 poll by the Levada Centre, 56 percent of the respondents said they wished the Soviet Union still existed. A recent survey by the All-Russian Centre for Public Opinion (VTsIOM) showed that 64 percent of Russians would vote for the preservation of the USSR if a referendum was held today, similar to the one held on March 17, 1991, which asked Soviet citizens if it was necessary to preserve the country in that form. Nostalgia for the Soviet Union is highest among Russians over the age of 55, and those who live in rural areas, according to Karina Pipiya, a Levada Centre sociologist. But there are a number of those like Marat — young people who are successful, integrated in modern society and who do not remember the Soviet Union — who long for it. A huge 50 percent of young people surveyed on the topic by VTsIOM share Marat's opinion, said Mikhail Mamonov, director of the VTsIOM research projects. Mamonov said those who are positive about the Soviet Union always point out the same three things: "A small but guaranteed salary, employment, things that are guaranteed for you." In an era of harsh market competition, people want to retreat to a time when they think all these things existed, Mamonov explained. The Levada Centre surveys show that nostalgia for the USSR peaked in 2000, when 75 percent of the population said they regretted its dissolution. Throughout the 2000s, the level of nostalgia decreased, reaching its lowest point in 2012; but even then, 49 percent of the population still expressed regret about the Soviet Union’s breakup. The level of nostalgia began to rise again starting in 2014. Mamonov says it is clear that economics is behind the growth of Soviet nostalgia. In 2000, the number of Russians living on or below the poverty line reached its peak. Later, as incomes began to grow, fewer people were longing for the past. With the beginning of the economic crisis, nostalgia has returned. Nina Mechtaeva, 65, lived most of her life in the Soviet Union, but unlike many of her peers, she has no desire to return to that country. "Sure, everything now is not perfect," she said. "But those who say how great it was in the USSR are forgetting the reality of that life. Constant lines in the stores and hospitals, party assemblies in which people spoke about that which they no longer believed in. The country was closed to the world." In Mechtaeva's opinion, many of the people her age who would like to return to the Soviet Union in reality just miss their youth. Mamonov agrees that the nostalgic image of the USSR clearly differs from the real country. "Today the Soviet Union is greatly idealized. All the positive elements are exaggerated and the negative ones are either forgotten or the level of intensity of the negative memories is reduced." Despite the popularity of the Soviet era, which is strongly associated with Socialism, modern Russian leftist political movements are not successful. The Communist Party of Russia, which has positioned itself as the heir to the Communist Party of the Soviet Union, received only 13 percent of the vote in the September 18 State Duma elections — a decrease of 6 percent from the December 2011 State Duma elections. Dva mechya (Two Balls) launched an online store in July 2016 to sell sneakers. The company’s products are made with technology from the 1970s, and feature a Soviet-style design. "This is simultaneously a tribute to the Socialist heritage and nostalgia for quality," reads a notice on the store site. In February 2016, plans were announced to resurrect Zenit, the Soviet-era single-lens reflex camera. The Rostekh Corporation intends to make the Zenit a luxury camera, similar to the Leica. Many other Soviet brands still exist in Russia today: Stolichnaya vodka, Sovetskoye champagne, Druzhba processed cheese and Alyonka chocolates all appeared on Soviet shelves and can still be found in stores. Soviet standards are also being resurrected in other parts of life. President Vladimir Putin brought back the Soviet-era sports programme GTO, a Russian acronym for “Ready for Work and Defence,” in 2014. The programme has 11 categories of fitness standards for both men and women, from schoolchildren to senior citizens. Putin said that he was reintroducing the programme to popularize sports and encourage people to be healthier. 25 years post-USSR, in what shape is Russia’s fleet?